The campaign asks Latin American MPs to request that their governments make public their positions on the Kenyan government’s proposed amendment to Article 27 of the Rome Statute. The amendment would exempt “serving heads of state, their deputies and anybody acting or is entitled to act as such” from prosecution by the ICC. MPs participating in the campaign are also asked to support a declaration providing sitting heads of state and government with immunity from prosecution for international crimes. 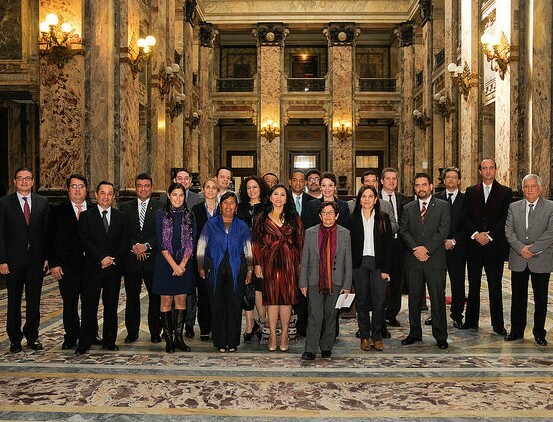 The workshop, which was hosted in Montevideo, Uruguay by the Chamber of Representatives of the Uruguayan Parliament, was organized by the Parliament of Uruguay and PGA, with the support of the Coalition for the ICC and the International Committee of the Red Cross. The aim of the workshop was to share practical experiences among lawmakers concerning the incorporation of the Rome Statute into domestic law, and also covered challenges with regards to cooperation with the ICC and the current status of the ratification of the Kampala amendments, as well as the role of victims within national judicial systems. The Coalition’s regional coordinator for the Americas, Michelle Reyes Milk, gave a presentation on passing legislation allowing for greater cooperation with the ICC and participation in the Rome Statute system. This is the second year that the Parliament of Uruguay has hosted this workshop, in recognition of Uruguay’s leadership on international justice issues in the region. Uruguayhas passed complete legislation incorporating the Rome Statute into its domestic law and is, to date, the only Latin American country to have ratified the Kampala amendments.